Taipei, Taiwan, Oct 31st, 2011 – Elitegroup Computer Systems (ECS), the world’s leading motherboard, graphics card, barebone system, notebook and mobile device manufacturer releases a new member of ECS Black series—H61H2-A2 Black Deluxe, another new face of ECS black series that provides much more advanced computing manageability, flexibility and gaming experience. 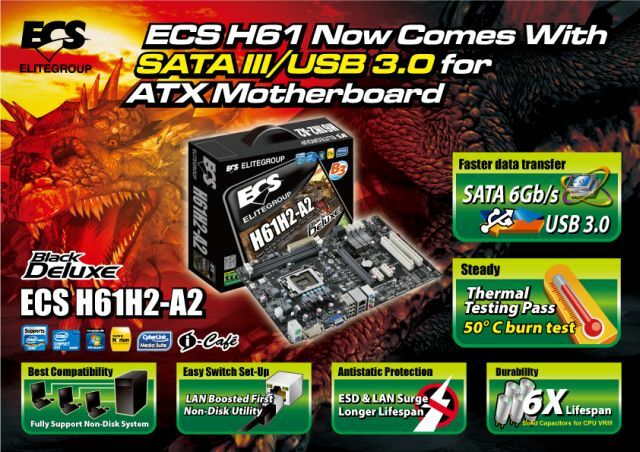 To bring the H61 ATX motherboards even further, ECS adopts additional chips to support USB 3.0 and SATA 6Gb/s for more users to experience high-speed transmission of new-generation interface. In addition, ECS H61H2-A2 Black Deluxe passes 50∘C Super Burn Test, which simulates severe computer-using environment to ensure the quality, durability and safety of your computer, also with all solid capacitors, anti-static protection and anti-surge protection. Moreover, H61H2-A2 Black Deluxe equips with many user-friendly designs and utilities including well-welcomed EZ Charger for easily recharging your mobile devices (especially Apple products) under any status of your computer, GUI uEFI BIOS to conveniently operate with simple clicks via mouse or keyboards, and well-famous ECS iEZ utilities (eSF/eBLU/eDLU). Lastly, with excellent Cost/Performance value, ECS H61H2-A2 Black Deluxe is way beyond luxury!